Carnegie: Magic Detective: Lost Manuscript of Houdini's Found!!!! Lost Manuscript of Houdini's Found!!!! I recall reading in one of the biographies of Houdini (though I don't recall which one) that he had plans to write the definitive book on magic history and also books on witchcraft and other topics. Well, his book on magic history took a slightly different turn and became the book known as The UnMasking of Robert-Houdin. Sadly, had Houdini not decided to attack his namesake, this book might have held a loftier place in the libraries of magicians. But the book on witchcraft seems to have never been written. Or was it? Actually, as it turns out the book was written but was only in manuscript form and had yet to be published. The Potter & Potter Auction, which takes place this Saturday August 23rd, features this very document. 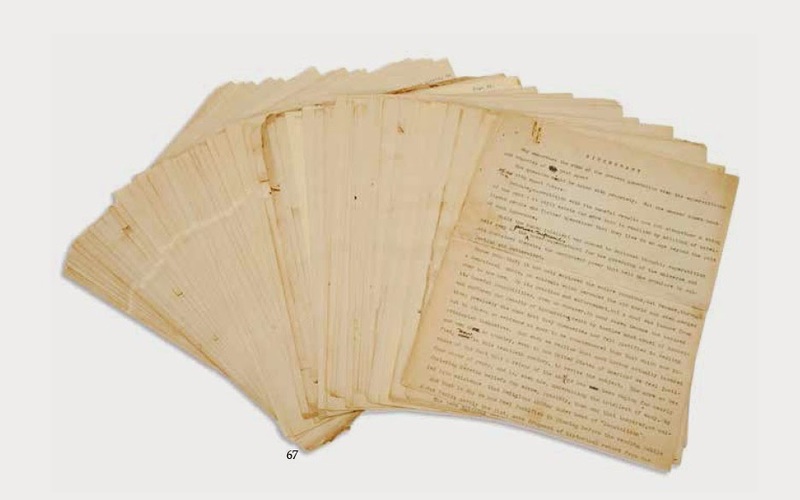 It's Lot#67 and is 62 numbered pages and also a letter from Houdini describing his work on the manuscript is also included. This could still be Houdini's final published work, if someone chooses to purchase it and then have the manuscript published. Quite an exciting prospect. This lot has the estimated price of $6000-$9000. Be sure to register for the auction as it is only three days away!